Become a Million Paws Walk volunteer today! Woof! We’re so excited that you are thinking about becoming a Million Paws Walk volunteer this year! Million Paws Walk simply couldn’t go ahead without our amazing volunteers. You could be selling tickets at the gates, making sure everyone knows where to go on their walk or even manning a merchandise stand! There are so many diverse roles available to choose from. You can read all about each role below! This year, we need to fill over 200 positions at our Sydney Olympic Park (Cathy Freeman Park) location. We also have loads of roles available at our regional walk locations, so if you love animals and want to do your part to support RSPCA – apply today! For this role, you need to be friendly, approachable and able to remain calm under pressure. The Information Tent Attendant needs to be friendly, approachable and able to remain calm under pressure. For this role, you have to be friendly, approachable, and remain calm under pressure. Entry Attendants need to be friendly, approachable, and remain calm under pressure. In this role, you should be confident in giving directions and polite when assisting participants. People Movers should also be alert and remain calm under pressure. For this role, Short Walk Marshals need to be confident giving directions and polite when assisting participants. It’s also important to remain alert and calm under pressure, as well as being comfortable on your feet all day. For this role, you need to be confident giving directions and polite when assisting participants. It’s also important to remain alert and calm under pressure, as well as be comfortable on your feet all day. For this role, you need to have excellent communication skills, be confident in approaching people, and possess a friendly and polite attitude. For this role, you’ll need good time management and organisational skills, be able to handle pressure, and be comfortable and confident working with different types of dogs. Dog All Rounders need to be comfortable and confident handling different types of dogs, be patient and alert, and possess a friendly and polite attitude. Suppawt Squad members need to be bubbly, enthusiastic, and confident in approaching people and dogs. Found your dream role? Great! If you’re over 18 years old and willing to have an early start to the day (don’t worry, it’s only for one day), then we want you! There are a range of volunteering roles to suit all personalities and fitness levels. You should be able to work well under pressure, cope with large crowds and be flexible. Of course, you’ve got to love dogs as well! You’ll need to bring your Free Travel Pass to access free public transport, or your P1 parking ticket to exchange for a validated ticket at Volunteer HQ. Of course, you’ll also need to bring a big smile and a positive attitude! Million Paws Walk is the RSPCA’s largest annual fundraising event. It involves tens of thousands of people and their dogs registering, fundraising and participating in walks held across Australia on the same day. All profits go towards helping abandoned, injured, neglected and sick animals in the RSPCA’s care. The event was launched in Queensland in 1994 by Dr Cam Day, who believed a special event involving animals walking together would be a fun day for both pets and their owners. Dr Day also believed it would promote responsible pet ownership, as well as raise much-needed funds for the RSPCA. 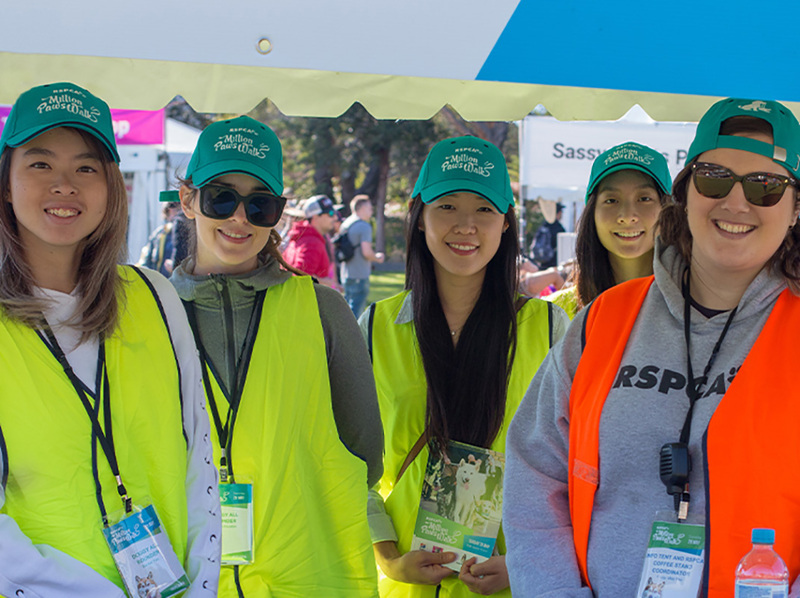 Since then, Million Paws Walk has expanded significantly to become the RSPCA’s biggest fundraising event, with more than 70 walks held across Australia each year. Million Paws Walk is held on the third Sunday in May. This year’s event will be held on Sunday 19 May 2019.